Thank you for this opportunity. 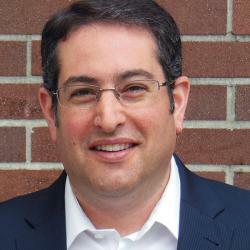 My name is Seth Klein, and I am the BC Director of the Canadian Centre for Policy Alternatives. Our office has spent the last eight years hosting the Climate Justice Project, a research and public engagement network that has produced a large volume of work about how to transition off fossil fuels in a just and equitable manner – an alliance that brings together a wide range of NGOs and academics. I would like to share with you the work of our senior economist Marc Lee, who heads up our Climate Justice Project, as well as the work of one of our research associates, veteran earth scientist David Hughes (who spent 32 years working for the Geological Survey of Canada, where he focused on unconventional gas, coal and oil research). I will also share some of my own thoughts on the Trans Mountain Pipeline proposal. 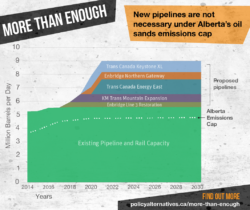 The result is what Marc Lee refers to as an “all of the above” policy – we have carbon pricing and various climate-related regulation, even while committing to significantly expanded oil sands production and promising new bitumen pipelines. Acting according to climate science and our Paris commitments does not, however, mean we have to turn off the oil sands tap tomorrow. We still have transition time. But it does mean we have to manage this industry for a planned thirty-year wind down. And if that’s the case it makes little economic or ecological sense to spend billions of dollars building new fossil fuel infrastructure and increasing capacity, particularly when that infrastructure has a working life span and expected financial return that well exceeds thirty years. Infrastructure such as pipelines, and the decisions we make about such infrastructure, matters because it tends to lock in place a certain development path. If we know we need to set out on a path towards fossil fuel wind-down, then now is not the time to be investing in new infrastructure that aims towards ramp-up. Infrastructure also tends to create its own logic and raison d’être – its own variation of “if you build it they will come.” Meaning, if it is built, it is because the interests behind it likely do not believe the promise of the Notley government in Alberta that oil sands production emissions will stop at 100 megatonnes of GHGs. They are making a calculation (a deeply cynical one) that, when the time comes this will be exceeded, and the new pipeline capacity will be used. They are “ragging the puck”, if you will, on the current political reality. In the case of this proposal, the logic and raison d’être of expanding this pipeline are fundamentally at odds with the clear direction we need to take. Let me focus on the recent paper by David Hughes, which we published in June and which was produced under the auspices of the Corporate Mapping Project, Can Canada Expand Oil and Gas Production, Build Pipelines and Keep Its Climate Commitments? There are many fascinating findings in David’s report. I recommend it to all of you. If one reviews the already existing pipeline and rail capacity for oil exports, even under the Alberta government’s plan to increase and then cap oil sands emissions at 100 megatonnes per year we already have all the transportation infrastructure we need. I would direct you in particular to the chart in the summary on p.7 (reflected in the infographic below), which shows that we already have surplus transit capacity. All the proposed new pipelines exceed our needs, even with a 45% increase in Alberta’s production over 2014 levels, which would be allowed under the Notley government’s plan. I also want to address a core argument made by proponents of the Trans Mountain pipeline, namely, that Alberta and Canada need more access to “tidewater” in order to capture a higher international price for oil, and thus increase public returns. This argument may briefly have been true at some point. But it is not true now. David Hughes, knowing I was presenting to you today, has also shared with me this table, which I now submit to you. The MUSE consulting report, upon which the National Energy Board Review relied, was premised on oil prices from 2012 and 2013. As you can see in the table above, which looks at the price differential between the Brent global benchmark price and the West Texas Intermediate price (the amount by which North American oil prices differ from average international prices each year), the problem is that the price differential between 2011 and 2013 was exceptional. The market has already moved to bring prices into alignment. The disparity between the North American and international oil price between 2011 and 2013 was due to a bottleneck in Cushing, Oklahoma, which has since been relieved by the completion of the Seaway Pipeline and the southern leg of Keystone XL from Cushing to the Gulf Coast. Such that, the price differential has largely evaporated and no longer covers the cost of transporting Alberta bitumen to tidewater. Finally, let me highlight two pieces of Marc Lee’s work. First, Marc has done calculations of what new pipeline capacity can mean with respect to GHG emissions. Marc’s conservative estimate is that new oil sands production associated with the Trans Mountain Pipeline expansion (just the expansion beyond the existing pipeline) would represent an additional 93 megatonnes of global GHG emissions per year. Compare this with total annual emissions here in British Columbia of 63 megatonnes. Or put another way, the Trans Mountain expansion’s emissions are equivalent to 13% of Canada’s total annual emissions. This is not the direction we want to go. Second, I want to share a paper Marc wrote back in 2012 about the proposed Enbridge Northern Gateway pipeline. I do so because it offers some very interesting analysis of the promised jobs that would result from these pipelines. In short, Marc’s paper highlights the ways in which pipeline proponents overstate the jobs that would be produced. He also looks at jobs placed at risk when spills or major leaks occur. 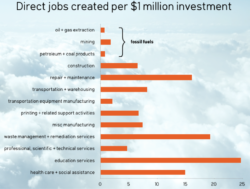 And finally, he looks at how many jobs are produced for each million dollars of investment in this sector compared to other sectors – and in short, the fossil fuel sector scores very poorly against so many alternatives, which are more labour intensive. In conclusion, with respect to the economic arguments, I would say this: while we need to deal with people’s very real anxieties about economic security and the reality of job loss in Alberta, we need to do so in a manner that is honest about both the economic and climate realities. And on both scores, more pipelines is a false hope. Getting to “tidewater” will not fetch a higher price with greater returns. These proposals are simply about accommodating expanded production at a time when we need to be moving in the opposite direction.